Free speech regulations allow The Satanic Temple to erect a monument at the Belle Plaine Veterans Memorial Park. Among its many tributes to fallen soldiers, Minnesota’s Belle Plaine Veterans Memorial Park will soon host a satanic monument. Next month, the Satanic Temple of Salem, Massachusetts plans to place “a black cube with inverted pentagrams, a soldier’s helmet and a plaque honoring veterans who died in battle” at Belle Plaine, reports local NBC affiliate KARE 11. This open forum is itself the result of a long local battle over how to handle issues of both free speech and separation of church and state when it comes to honoring veterans at Belle Plaine. 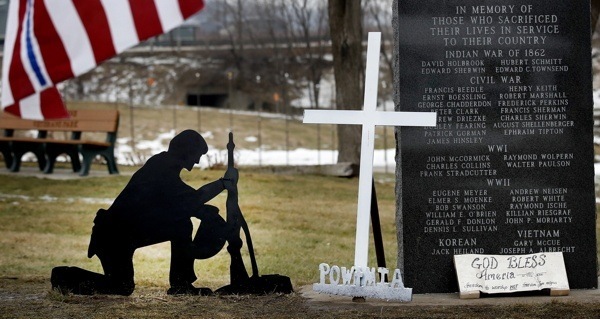 The debates began when the Freedom From Religion Foundation threatened to sue the city after it allowed Belle Plaine to host a “modest but poignant 2-foot steel war memorial called ‘Joe,’ which features a cross in its tribute to soldiers,” reports the StarTribune. Under threat of a suit on grounds of separation of church and state, the city removed “Joe” in January. But when locals then complained at the removal, the city reached a compromise in the form of its “limited open forum,” which allows a rotating cast of ten or fewer memorials of most any provenance so long as they honor fallen soldiers. This allowed “Joe” to return this month, but also paved the way for all manner of other monuments to stand at Belle Plaine alongside it. And The Satanic Temple was quick to seize this opportunity, applying for a space in the forum and receiving approval from the city. With approval granted and the monument set to be put in place, local opinion on the matter is predictably divided, yet subdued, at least according to reports. Next, read up on The Satanic Temple’s plan to take its After School Satan Clubs nationwide. Then, revisit the hysterical satanic panic of the 1980s.